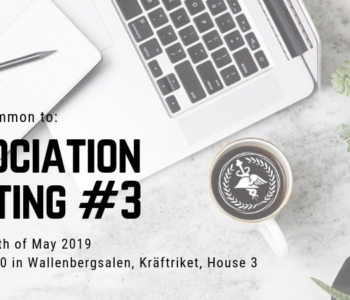 This is a summon to the third annual Association Meeting 2018/2019, on Sunday the 5th of May 2019, at 12:00-19:00 in Wallenbergsalen, Kräftriket, Hus 3. Potential motions shall be in possession of the Board at least two weeks before the meeting, on Sunday the 21st of April. 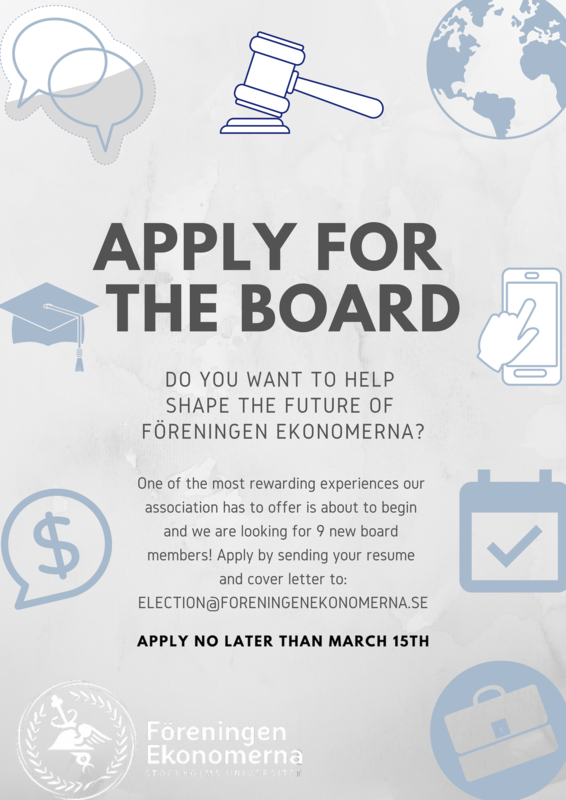 E-mail your motions to president@foreningenekonomerna.se and write “Motion Föreningsmöte #3” in the subject line. 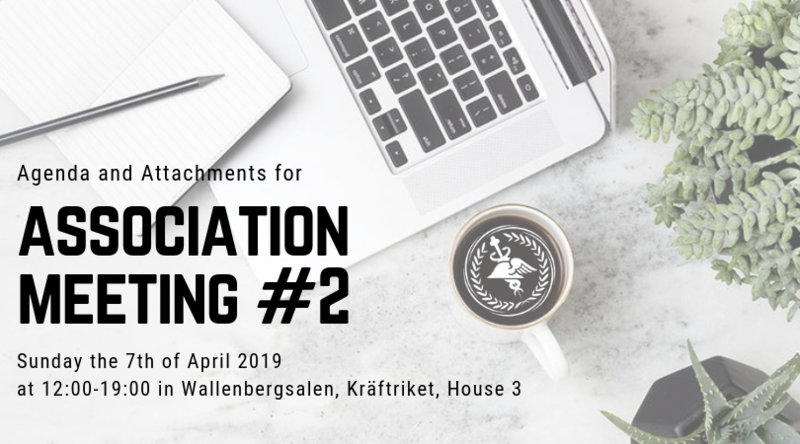 The agenda will be made available in the venue of Föreningen Ekonomerna and on www.foreningenekonomerna.se one week before the Association Meeting, on Sunday the 28th of April. 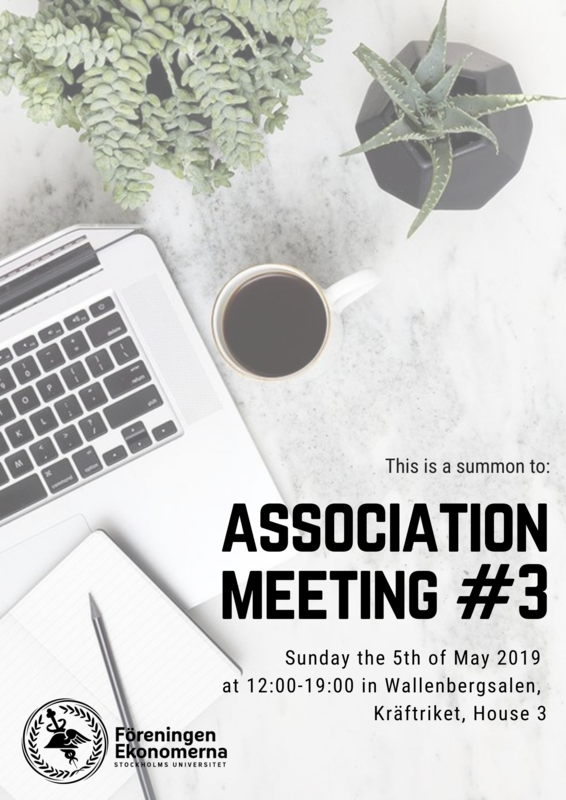 In order to be able to vote at the meeting, your membership fee has to be in our account at least two weeks before the meeting, on Sunday the 21st of April. Det här är en kallelse till Tredje Ordinarie Föreningsmöte 2018/2019, söndagen den 5 maj 2019 klockan 12.00-19.00 i Wallenbergssalen, Kräftriket, Hus 3. Motioner skall vara styrelsen tillhanda senast två veckor före mötet, söndagen den 21 april. Sänd dessa till president@foreningenekonomerna.se och ange “Motion Föreningsmöte #3” i ämnesraden. 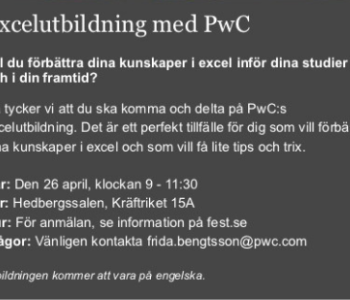 Agendan kommer finnas tillgänglig i Föreningen Ekonomernas lokaler och på www.foreningenekonomerna.se en vecka före föreningsmötet, söndagen den 28 april. För att kunna rösta på mötet behöver ditt medlemskap ha betalats senast två veckor innan, den 21 april. Listen up members! 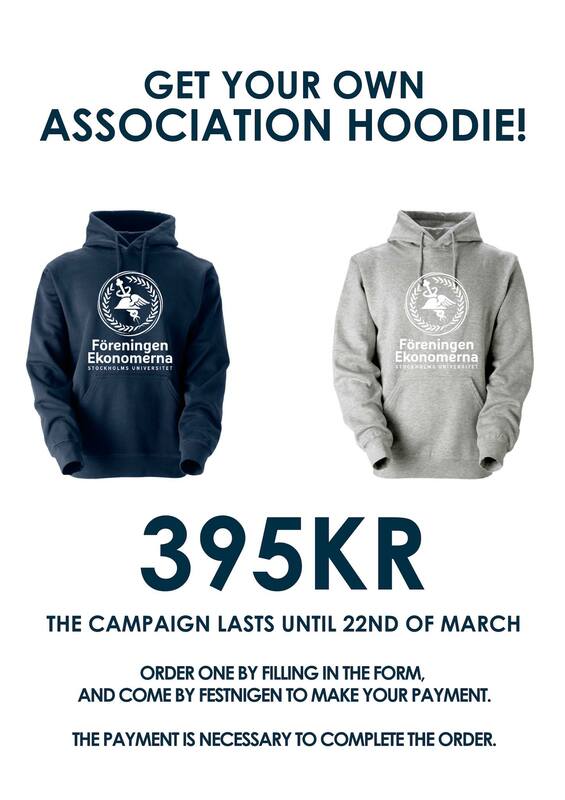 You now have the chance to get your own amazing association hoodie for only 395kr! To place the order, you need to fill in the form in the link below and make your payment in Festningen before the 22nd of March. If you are unable to come to Festningen during this time, please contact Emilia Ishak in the Board (vicepresident@foreningenekonomerna.se). – A filled in form without a received payment will not be included in the order. – We will order all of the hoodies after the 22nd and then it will take approximately 10 days for it to arrive in Festningen where you can come pick it up. 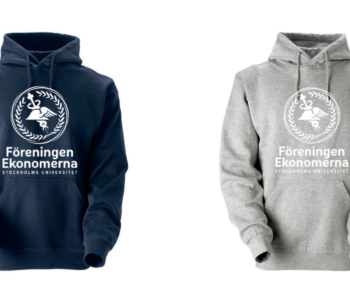 – We do not ship hoodies, you need to come and get it in Festningen. This is a summon to the second annual Association Meeting 2018/2019, Sunday the 7th of April 2019, at 12:00-19:00 in Wallenbergsalen, Kräftriket, Hus 3. Potential motions shall be in possession of the Board at least two weeks before the meeting, Sunday 24th of March. 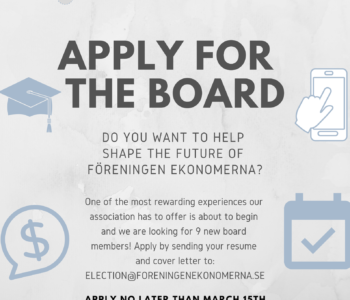 E-mail your motions to president@foreningenekonomerna.se and write “Motion Föreningsmöte #2” in the subject line. The agenda will be posted in the venue of Föreningen Ekonomerna and on www.foreningenekonomerna.se one week before the Association Meeting, Sunday 31st of March. To be able to vote at the meeting your membership fee has to be in our account at least two weeks before the meeting, Sunday 24th of March. Det här är en kallelse till Andra Ordinarie Föreningsmöte 2018/2019, söndagen den 7 april 2019 klockan 12.00-19.00 i Wallenbergssalen, Kräftriket, Hus 3. Motioner skall vara styrelsen tillhanda senast två veckor före mötet, den 24 april. Sänd dessa till president@foreningenekonomerna.se och ange “Motion Föreningsmöte #2” i ämnesraden. Agendan kommer finnas tillgänglig i Föreningen Ekonomernas lokaler och på www.foreningenekonomerna.se en vecka före föreningsmötet, söndagen den 31 mars. För att kunna rösta på mötet behöver ditt medlemskap ha betalats senast två veckor innan, den 24 mars. 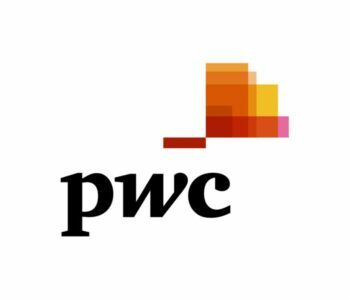 The application to become a buddy in International Business Week 2019 is now open! International Business Week is celebrating its fifth anniversary and we want YOU to be a part of this amazing project. This is an opportunity to expand your global network, develop your leadership and teamwork skills, and gain useful connections with Swedish companies. 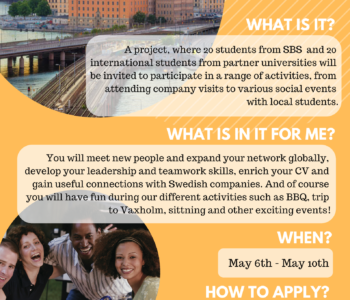 Meet students from all over the world and make friends for life while engaging in fun activities such as a trip to Vaxholm, an escape the room adventure and much more! 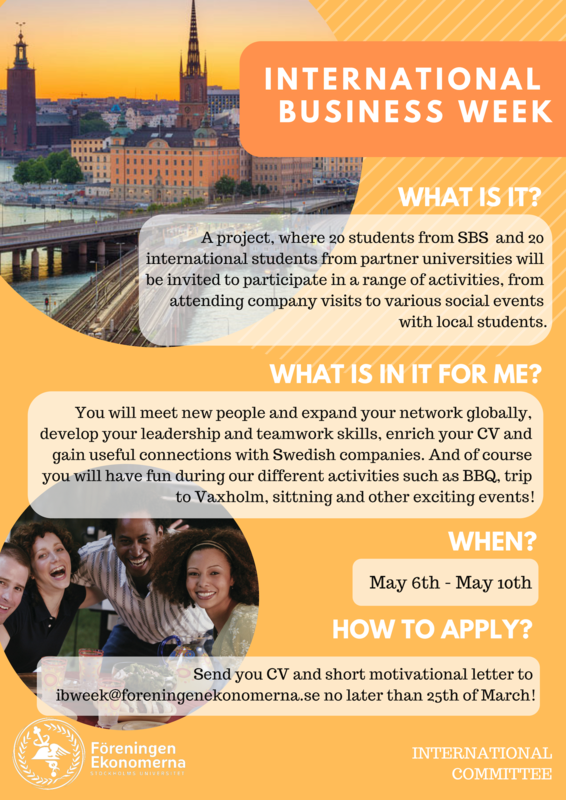 Apply by sending a short motivational letter and your CV to ibweek@foreningenekonomerna.se no later than 25th of March. We are looking forward to receiving your applications, and if you have any questions, do not hesitate to contact us! Apply to the Board of 19/20 today! Do you want to strategically move the Association forward and at the same time forge new friendships that will last for a life time? Being part of the board is one of the most important intriguing work you can do, but most importantly maybe the most influential if you want to impact the Association. (in other words, you have until the 15th of March 11.59pm!). 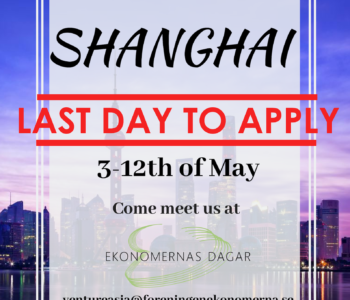 Last day to apply to Venture Asia! China has changed itself – and changed the world. Its growth story is far from over. 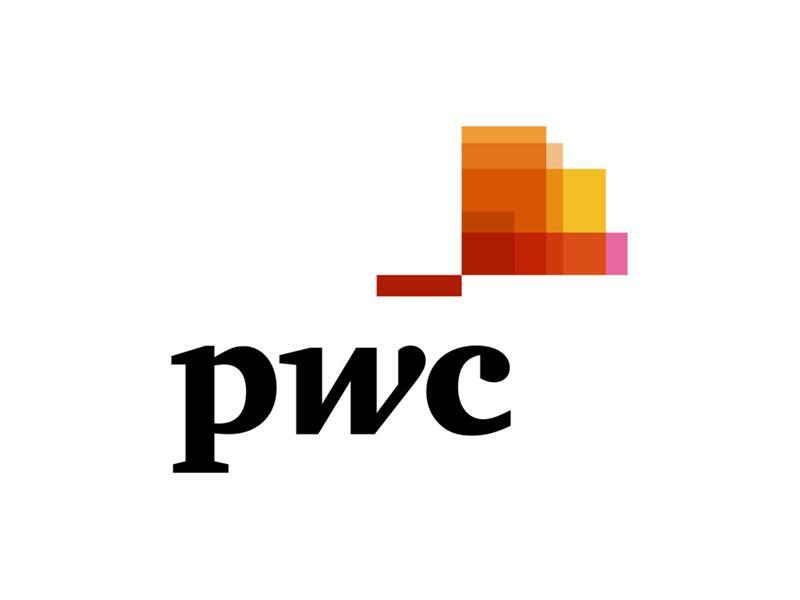 During this year’s trip you will be visiting world’s largest city, center for finance and trade, home for giants such as AliExpress and WeChat and experiencing the transformation with your own eyes. Strengthen your CV and expand your global network by becoming one of the participants during this year’s trip! Apply by emailing your CV and a short motivation letter to: ventureasia@foreningenkonomerna.se. 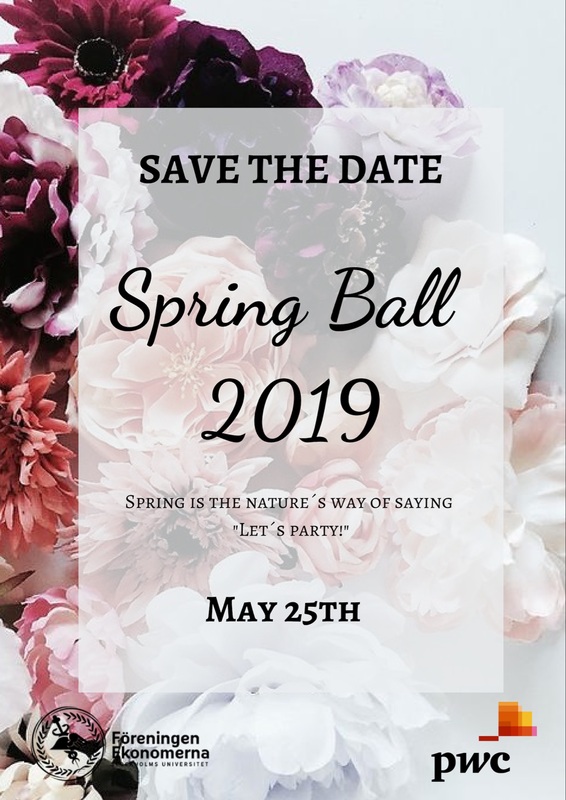 Winter is almost over and what better way to welcome spring than to gather all together, spend time with friends around a table and dance the night away? 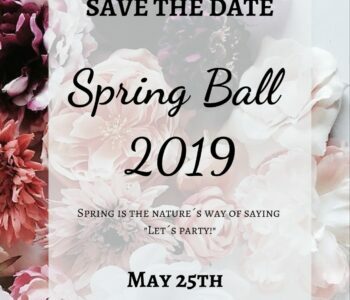 For the third consecutive year, Föreningen Ekonomerna invites its members to gather to the most elegant and unique event of the year: Spring Ball 2019! The event will take place on May 25th. Sign that date on your calendar and keep yourself free! Tickets are limited and will be released soon: stay tuned not to miss this unique chance to party elegantly!